I didn’t do much writing last week because I moved into a new apartment. My creative energies had to be shifted to tasks like artfully arranging furniture and pictures on the wall. Such tasks are not naturally ingrained in me and I do not usually relish home décor projects so it took everything I had. There was nothing left over to put words on a page. But I found myself having an amazing time buying (and sometimes assembling) furniture, putting years of collected photos and art on my walls and figuring out what should go where. My previous apartment was furnished. So while it marked the first time I was living on my own, the place wasn’t really mine. Things were already situated. There was an awesome green couch and a Buddha statue perched on a shelf. It was all good and fine but none of it was really my idea. My current apartment is unfurnished, so the past week or so, when I’ve found myself at yard sales, furniture stores and the home improvement aisle of Target, I was making decisions as to how I will fill this empty vessel. And for the first time ever, there is no one to confer with. There’s no roommate or significant other to which I hold up a shower curtain and say “do you like this or no?” There’s no comingling of stuff—a concession to hang what I might consider tacky if the other person will just allow my sometimes-funky taste to prevail in certain cases. Which brings me to the red leather chaise. While shopping for a couch and new mattress at a local furniture store, I saw and fell in love with the chaise. I could have sworn the tag said $99, a price that I was willing to spend. However, when the invoice was written, I looked down and was deflated to see that the chaise was $199. “Are you saying you won’t buy the chair unless it’s $99?” he asked. “Well, then it’s $99,” he said. A few days later the furniture was delivered and the red leather chaise was the first thing that the men brought into my apartment. I pointed them to the spot that I had designated, right in front of the picture window in my living room. After they left, I went straight to the chaise, stretched out and smiled. The next morning, I returned to the same spot, this time with my journal and a cup of coffee. I felt a huge sense of peace and I thought about how it was the best $99 I had ever spent. Because maybe it’s just a chair, just a piece of furniture that is extremely comfy and sparks envy amongst my friends that come by to visit; but for me, it’s a little more. The small table that I found at an estate sale to put by my front door to hold keys and sunglasses, the wine rack/bar that I found at the yard sale down the street—those are all decisions that I have made by myself and for myself, deciding what I want my surroundings to be. And this chair—this red leather chair—it’s a gift to myself. Yes, it’s slightly funky and it’s a small indulgence. 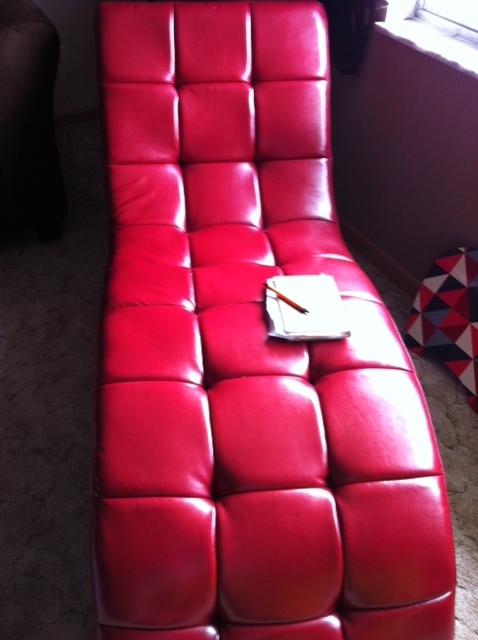 Because while I don’t need a red leather chaise, maybe I have to have it. It will follow me from dwelling to dwelling for years to come. Perhaps future guests will ask about the chair and I will tell them that it’s where I found peace in a time of change, that it was, in fact, a symbol of a newfound independence. Or maybe I’ll just keep that to myself and tell them the story of the furniture salesman who wanted me to have that chair as much as I did. The other day I got a surprise visit from one of my oldest and dearest friends. There I was, not knowing what my day would bring and what it brought was her smiling face in the passenger seat of another friends’ car. After the three of did an intense exercise class followed by a well deserved lunch, she came back to my apartment and we spent an hour on my couch, talking and laughing. And though she only lives an hour away, it was only the second time I’ve seen her since I’ve moved back…both of our lives busy. Hers with three children and a career, mine with who knows what. But I’ve known this friend since first grade, and the almost thirty years that have occurred since then allowed us to easily bypass the small talk. And so the little girl who accompanied my parents and me every winter to pick out a Christmas tree became a woman sitting on my couch talking about the big things in life. We talked about my divorce and her thriving family. We talked about fears and insecurities and the different ways that we show love to the people around us. She told me that she was proud of me for the way that I was handling things at this point in my life. “I wish I could have enjoyed the journey a little more…getting to all those things I wanted my life to be. It seems like you’re doing that,” she said to me. “Maybe I’m enjoying it so much because I have no idea what I want to do,” I said to her. At that, we both dissolved into laughter. But it reminds me of a saying that I’ve heard. The path is the goal. It’s an encouraging philosophy. Because instead of plotting the road ahead and figuring out an endpoint, the focus lies more on the things that happen in this moment, and the next one….and so on. The only thing that never changes about the path is that it’s always changing. And in that respect, what more can we be expected to do except hold on for all we are worth. And though I don’t have an answer for what I want to DO, capital letters, in life; I am doing the things that make me happy. I love to write…and so I write. Yoga has brought me great happiness in life…and so I am pursuing that. I really like wine…and so I got a job at a wine bar. Being in the same city as old friends and my parents makes me feel loved and protected and so it is here that I stay. And that, right now, is my path and therefore, my goal. So maybe I don’t know where exactly this path leads. Hopefully these things that bring me happiness will wrap themselves up and fit together like a fine-tuned machine at some point. Until then…. Monday. It’s my first day off in a week. My feet are screaming for mercy and a long soak in Epsom salts. My mind is filled with various things that I must accomplish now that I actually have some time. I know that at some point in the next few days I will be moving heavy loads up and down stairs in 85 degree weather. Last night I looked at pictures of my dog for half an hour, wishing that I could again nuzzle my face into her soft brown fur so that I wouldn’t feel lonely. These are my challenges and I accept them as minor. Because they are surely to be accomplished amidst bouts of laughter, time with friends and offers of assistance. Tonglen is a Buddhist term that means to send and receive, creating space in the world around us so that people can breathe freely. The practice instructs us that when we encounter pain and suffering in this world, we breathe it into our being with the wish that everyone could be free of pain. And when we encounter happiness and positivity we exhale that to the world around us, a gift to share. I first read about tonglen in a book that I have mentioned on this blog before—When Things Fall Apart by Pema Chodron. At first it didn’t make sense. In the yoga and meditation that I had practiced previously, the idea was to focus by breathing in positivity and strength and exhaling doubt and weakness. I used this quite often when things were falling apart. But the idea of tonglen is that it’s only when we allow our hearts to break, to let suffering creep in—that’s when we dissolve the armor that builds up within us—and underneath is the true beauty of life. And so I began thinking about this positivity that I had been breathing in. Where did it come from? And then I read this article about the problems with radiation in Japan following the earthquake in 2011. Stay with me here….In villages that had to be evacuated due to nuclear contamination, workers in protective white suits had planted vast field of sunflowers seeds because they are a species that can leach some of the radiation out of the soil. What resulted was a less toxic land and fields of brilliant flowers. And so maybe at some points in our lives, we are the soil looking for respite. It’s all we can do to keep ourselves afloat and we rely on others to put positivity into the atmosphere so that we may take it into our beings when we need it most. And at other points in our lives, we are that sunflower, blooming with everything we have to give, taking in the hardships of those around us so that relief can be felt like fields of yellow flowers. I’m getting ready to sign a new year-long lease on an apartment in Huntington (rest assured—not the sketchy one from the previous post). But I’m committing to the next year, at least, of my life taking place here. And if you would have told me about a year ago that this would be the case, I probably would have called you a crazy person. But life has thrown me some curve balls and right now, this is the best way I can figure to knock those curve balls out of the park. Because isn’t that what we do when we talk with those that we don’t know that well? We take all words of substance and turn them into talks about the weather. We talk about the crazy storms that uprooted trees and the heat index that creeps into the triple digits. It’s safer that way. Everyone understands weather. When we talk to someone about the rain that blew through town last night, we know that they will agree with us, nod their heads and validate our thoughts. I find myself wanting to have some weather to support my decision to stay here when I’m talking to friends from afar. Instead I simply tell them: “I’m just really happy here right now.” And the great thing about friends is that I don’t need talk of thunderstorms or heat waves. They won’t turn their heads to the sky in a vain attempt to second guess me. They will simply take these words that I speak as truth. And the truth is that my life is a bit unsettled now. I don’t have much of a plan going forth….and I don’t even have furniture to put in this new apartment. But what I do have is this feeling of happiness and independence that washes over me fairly often these days. It hit me last week when I found a great new place to live and didn’t second guess my decision to take it on the spot. It hit me driving home from a night out with friends the other night. It even hit me while I was at work the other night. And in that respect, I feel more settled than I have been in a long time. But the brain works a bit like Mother Nature. She is not so easily tricked. She blows storms into our life without a warning and the best we can do is try to prepare for them. And when she gives us sunshine, we must bathe in it. I am currently looking for a new apartment. Yesterday I went to visit a possibility and I knew from the minute that I got out of the car that I would not be interested. It was sketchy at best with a man who defines the word ‘sketchy’ sitting on the porch. “Are you a college student?” the landlord asked. After I thanked him for the compliment, we moved into the house. “How many people would be living here?” he asked. “It’s just me,” I told him. With that, we turned around to leave the apartment, both of us knowing that it wouldn’t work out due to aforementioned sketchiness. I’ve had a few situations lately where my aloneness, my independence, my it’s-just-me-ness, has been made glaringly obvious. It’s a foreign feeling but not altogether unwelcome. When I was without power in my apartment for a couple of days, in the middle of an intense heat wave, all I had to was pack a bag and hop from air-conditioned car to air-conditioned temporary places of rest and sleep. Friends of mine who have children and pets and no power do not have that luxury—they were left to either sweat it out in the discomfort of their own homes, or move into other houses or hotels. I had no one but me to look out for, to take care of. And when my power was blissfully restored by the wonderful people at the electric company, allowing me to take care of myself, I could then offer my assistance to others in need. It’s a hard habit to mold—this whole looking out for myself thing. As a woman, I am a bit predisposed to take care of others first. As the emotional being that I am, this predisposition weighs even heavier. “You’re a giver, Ashley,” my mom said to me a long time ago. She’s a therapist so the woman knows what she is talking about. Still, I have spent the past eons of my life proving her right, putting others’ needs in front of my own. But while I was giving these gifts–wrapping the emotions and the efforts up in these pretty little packages–I was the kid sitting under the Christmas tree wondering why Santa hadn’t come. Before you go feeling too sorry for me, I should say that I have pretty healthy relationships with my family and friends. I give to them; they give to me, the balance shifts back and forth in gentle oscillations. Let’s be honest though—-I’m talking about men. And in the interest of not boring you with the details of my love life, let’s just say it’s been a long time since I’ve been single. I tend to throw myself into relationships, displaying all that is lovable about me from the get-go, making deposits without demanding withdrawals. And this works for me….until one day it doesn’t. So now I’m vowing to listen to my mom’s advice from years ago, and hope that I’m not too late. Last week, I was toiling with a decision. I went back and forth, asked for advice from friends and weighed the pros and cons. Finally, I sat on my couch, turned on a favorite song and put my head in my hands, focusing all of my energy on the question, hoping an answer would pop into my head. I didn’t exactly come up with an answer in those four minutes that the song played. But what came to me during those minutes was the realization that for the first time in many years I was making a decision without taking anyone else into account except for myself. It was just me. 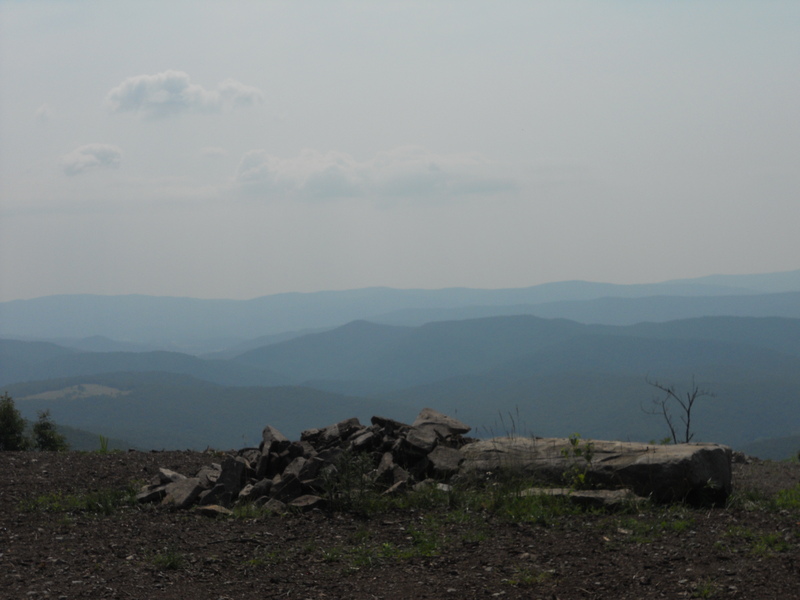 It felt selfish—but wonderfully so…..
We started getting the texts as we stopped for ice at the base of Snowshoe Mountain. Huge storms had just hit Huntington and knocked out the power. They were headed our way, had been following us apparently during our four hour drive across the state. We’d been planning this girls’ weekend in the mountains for a while, at a friend’s family house tucked away on a private hillside. The storm started just as my friend and I dashed inside the house, the last ones of our group of seven to arrive. The power went out as we were eating lasagna. We lit candles, continued to talk and eat and drink wine. Then we went to go do the dishes. We were on a well system. We didn’t have water. The texts started rolling in from concerned husbands and families. They told us that perhaps we should come home. That night we sat around the table playing games that kept us in stitches for hours….but everyone kept checking their phones….being present and back home all at the same time. We never thought about leaving. The next morning we all lost cell service. We started calling ourselves pioneer women. We sat around in lounge chairs all day and started a fire so that we could make coffee and reheat lasagna. We found a garden shovel and pooped in the woods. We poached the neighbors’ hot tub. We played a game called “What time is it?” because no one knew and no one really cared. We heard from the neighbor that perhaps we wouldn’t be able to find gas for 100 miles. We didn’t worry. This past weekend had been planned for over a month. We picked it because no one had scheduling conflicts, a feat when you involve seven women with busy lives. Once we inked it in, I realized that we would be arriving on the very day that my divorce was final. We joked about it being a party for me. And though the occasion for the party was sad, those mountains across the state could also provide a gateway to my next chapter in life. And I knew that there was no better way to start that chapter than with a group of women who have provided me so much comfort, not only in recent tough times, but in times good and bad stretching back for 20 years. There was laughter ringing from that house in the mountains for the entire weekend. And we weren’t laughing in spite of our pioneer adversities, we were laughing because of it. The lack of phones, TV, and toilets forced us to truly relax and soak in each other’s friendship. And I know I can speak for a few of us when I say that the laughter was needed more than anything at that point in time. It was a bandage for hard times suffered these past few months, a reminder that it can be found again….sometimes you just need to look in strange places.